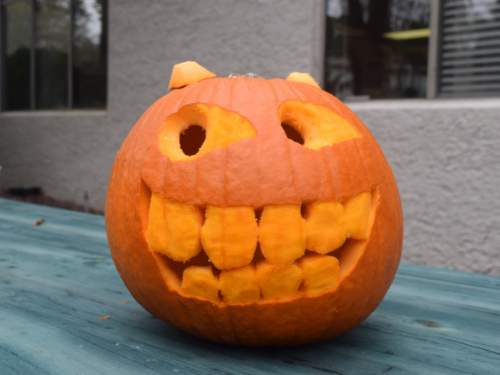 Our pumpkin carvers were inspired again this year. I think they’ve done the Celts proud in honoring this tradition and they achieved it all within the contest rules’ time limit! 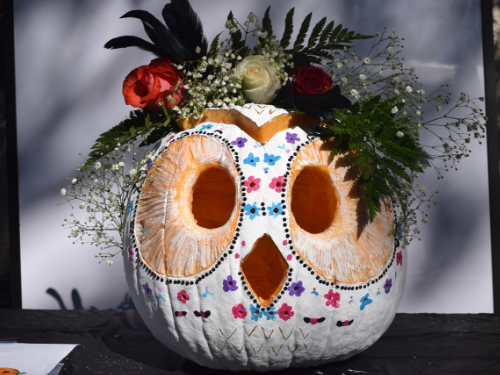 In viewing the finished masterpieces, I loved seeing how various Spinnaker Departments used their unique skills to create their Halloween works of art. 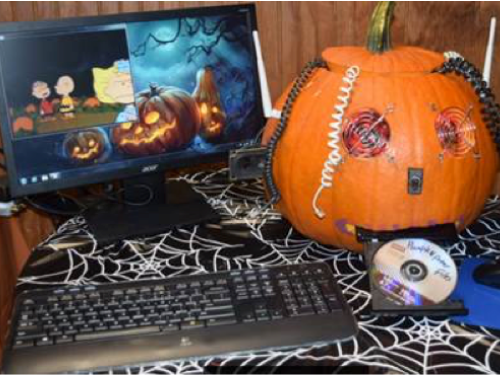 The IT Department’s ingenuity shone through in their creation of – in true tech fashion –a real live working computer named Pumpknputer whose ears were functioning speakers, whose nose was a power switch and whose mouth housed an external CD drive. 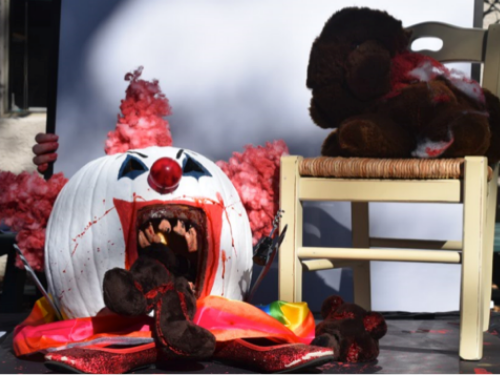 The jury is out on Pumpknputer’s memory, speed or whether he comes with anti-virus … but with Pumpknputer there is certainly more than just meets the eye! 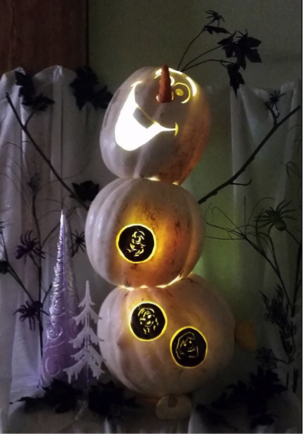 I was lucky to see first-hand how cute and jubilant Olaf (from the movie Frozen) was created from the ground up (even though it actually all started with his belly). 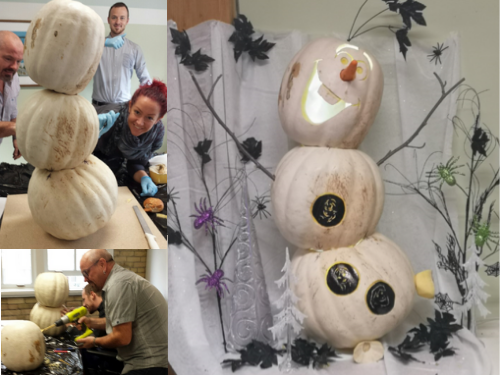 Carving this white strain of Cucurbita pepo (pumpkin) posed a new challenge for this skillful Toronto team. 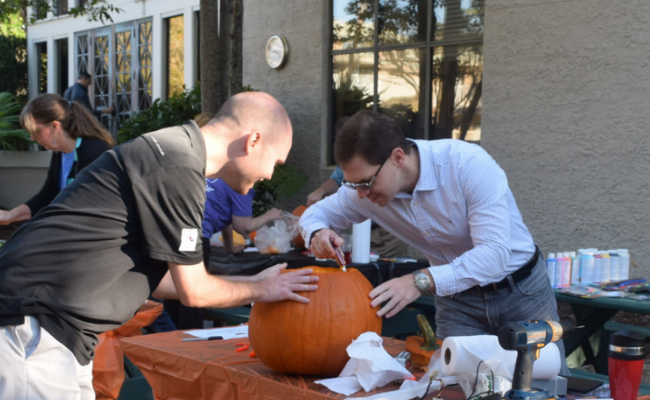 Compared to a standard orange pumpkin, the white pumpkin has a hard shell-like exterior (like that of butternut squash) and a softer interior which required deftness with a drill and various blades that is akin to that of a contractor or surgeon. I felt I was watching surgery minus the scrubbing in and wearing of the mask. There was the surgery planning stage, layout of tools, pre-op, the surgery and post op (addition of hair, nose, arms and feet). I would agree that Olaf was in a much better state after his operation than he was before it. Like all expert surgeons, this team was pleased with their work and the best part was that Olaf’s happiness was infectious. Once he was finished I found excuses to walk by him because he would instantly bring a smile to my face and warmth in my heart. I’m not sure who gets more pleasure out of this centuries-old tradition – the carvers or the viewers of the final masterpieces? My guess – and hope – is that the joy is shared by all. On that note – I realized that this rather involved tradition is not necessarily widespread despite its European origin. 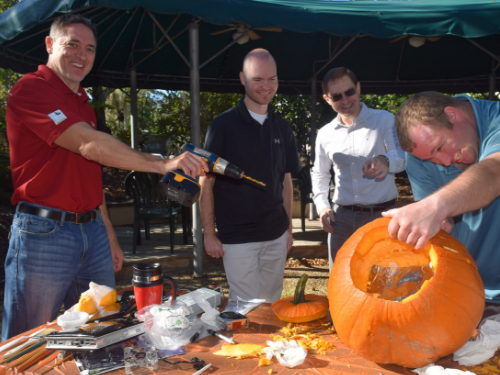 Norwegians, Kiwi’s and South African’s, to name a few nationalities, don’t indulge in annual pumpkin-carving to celebrate Halloween. I’m personally glad I grew up with the tradition. I think any opportunity to feed our creativity is time well spent not to mention pure unadulterated fun. 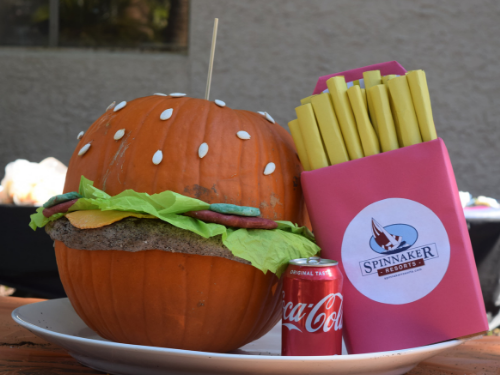 Spinnaker wishes you all a fun, happy and safe Halloween and may you enjoy your toasted and salty pumpkin seeds – or for the sweet-toothed bunch – chocolate and candy. 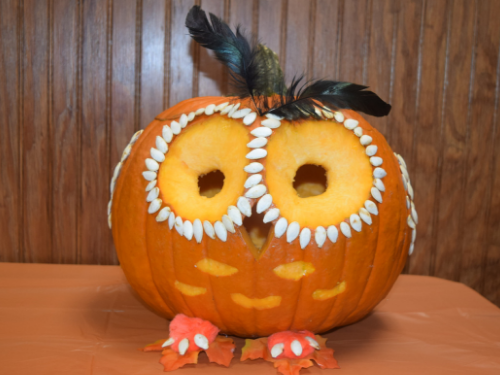 Whether you are raiding your kids trick or treating haul or treating yourself at your office goodie bowl – enjoy all that is Halloween! Marketing Department – Whoo likes this one best? 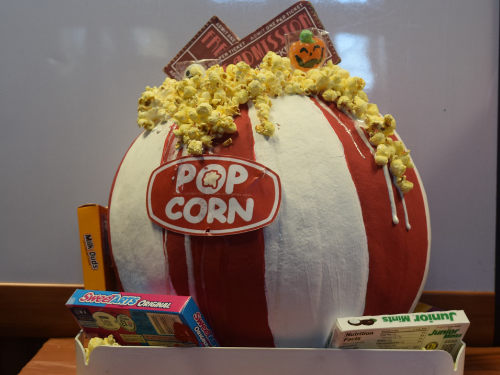 Front Desk – Movie Time!